Note: This is 1 of the 7 stones mentioned in the official Met. Soc. entry included below. History: Purchased by Dustin Dickens in Morocco, January 2016. Physical characteristics: Seven identical appearing stones with weathered exteriors. Saw cuts show a breccia with black shock melt domains, a few vesicles were observed. Petrography: (C. Agee, UNM) Microprobe examination of a polished mount shows fragmental breccia of basaltic clasts, feldspars clasts, pyroxene clasts, and vesicular shock melt pockets. Accessory silica, ilmenite and chromite are present. Geochemistry: (C. Agee and B. Ha, UNM) Diogenitic pyroxene Fs22.6Wo2.1, Fe/Mn=31, n=1; cumulate eucritic pyroxene Fs35.1±2.9Wo5.3±2.6, Fe/Mn=29±2, n=4; basaltic eucritic pyroxene Fs50.2±4.5Wo8.3±4.3, Fe/Mn=30±1, n=7; basaltic sub-calcic augite Fs37.8Wo23.5, Fe/Mn=29, n=1; plagioclase An92±1.9, n=9. Classification: Polymict eucrite based on the volume percent lithologies: ~62% basaltic eucrite, 31% cumulate eucrite, and ~8% diogenite. 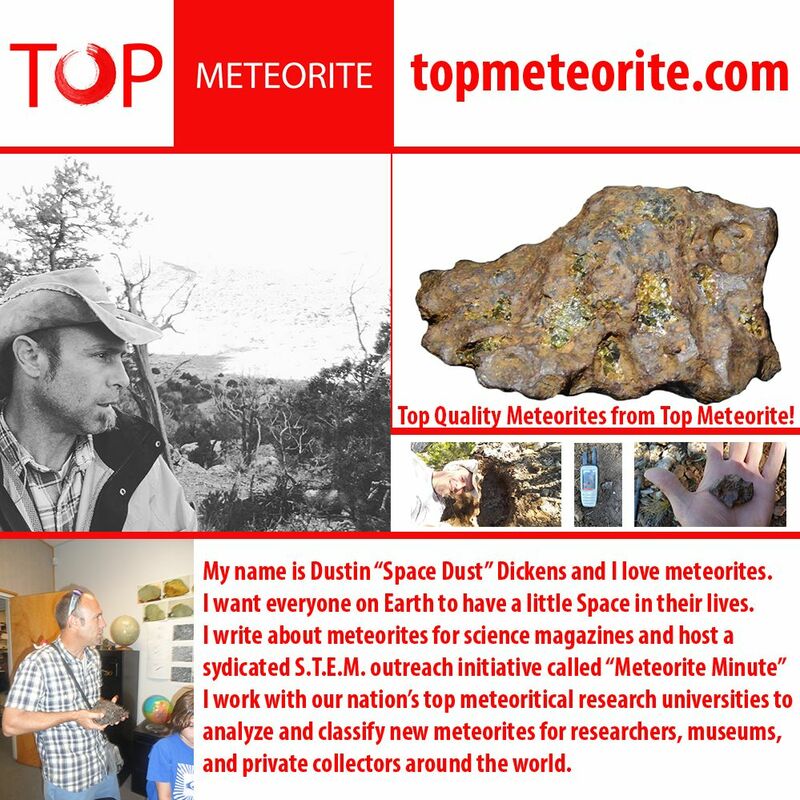 Specimens: 20.0 g including a probe mount on deposit at UNM, Dustin Dickens holds the main mass.